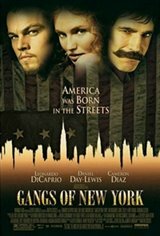 Amsterdam Vallon (DiCaprio), a young Irish-American immigrant, is released from prison after fifteen years, and returns to the Five Points bent on revenge against William Cutting (Day-Lewis), a.k.a. Bill the Butcher, the powerful anti-immigrant gang leader who killed Amsterdam's father. Amsterdam knows the first step toward accomplishing his mission is to infiltrate Bill's inner circle. However, he finds his difficulties increasing after meeting Jenny Everdeane (Diaz), an enigmatic pickpocket whose fierce independence and undeniable beauty fascinate him. Yet Jenny has a past too, which unexpectedly complicates his plan. Amsterdam's journey becomes a fight for both personal survival and to find a place for his people. The struggle reaches a fevered crescendo during the 1863 Civil War Draft Riots -- the most explosive episode of urban unrest the American nation had yet seen.